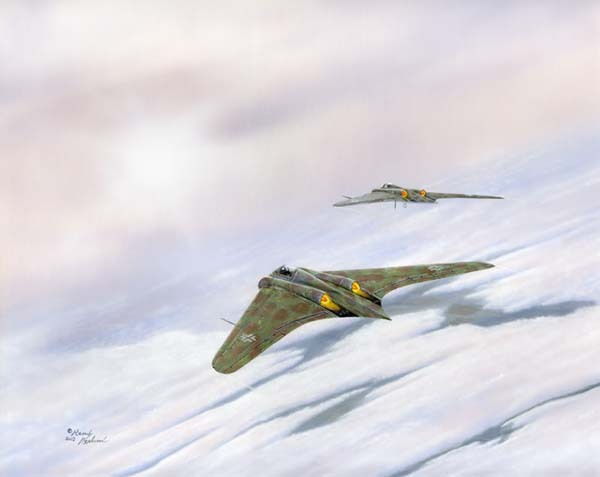 This is the design of the Horten brothers carried into a theoretical future known as "Luft '46"
Luft '46 is a term used to describe aircraft that the German aviation industry was working on at the end of the second World War. In this case, prototype aircraft were built and flown, but the Go 229 never saw production. Examples were captured by the Allies near the end of the war. My interest comes in from a love of both aviation and Science Fiction. Just one look at this aircraft is enough to see how science fiction of the past was just as amazing as it is today. Only just how fictional is an airplane that was far enough along to be flight tested? Imagine a few more months down the road when these flying wings would have been hunting B-29 bombers in the skies over the Reich. These people were half way to stealth technology back in 1945. We have only put flying wings into regular military use in the past decades. See my plastic model of the Go 229 in that I used to make this painting!